Many of the world’s metropolises have landmarks that strongly embody the social, cultural, or political moment in which they were built. Often the symbolic power of such monuments can exert a tangible force, by shifting or re-asserting an urban center, or by creating or usurping a region’s identity. Los Angeles has always lacked such monuments. Apart from its visible infrastructure – the freeways or the River – perhaps only the Getty Center could be attributed such status. Yet the lasting urban effects of the Getty are dubious. It hovers, disconnected from the grid, inaccessible by foot, expressing the aspirations of the existing centers of power. At the lower-rent end of the 10 freeway are presently emerging two new Los Angeles landmarks: Raphael Moneo’s Cathedral of Our Lady of the Angels and Frank Gehry’s Disney Concert Hall – both just blocks apart on Grand Street in downtown. Only in the future will we know if these buildings become the icons that LA so conspicuously lacks. However, as the concrete cures on the new Cathedral and the stainless steel sheathing begins to cover the Disney concert hall, the popular and trade press are already beginning to herald these structures as the crown jewels in a newly affluent and developed downtown. We believe, however, there are more complex, in some cases problematic, architectural and urban implications to these new buildings. Architecturally, the two structures are emblematic of the two current prevailing stylistic poles: Gehry as the (perhaps accidental) godfather of the voluptuous, software-aided blob, and Moneo, an Iberian representative of Spanish, Swiss, and Dutch European neo-Modern refinement. In this comparison, Gehry’s building is the more exuberant, Dionysian, and unapologetically formal building to the Apollonian, relatively rational Cathedral. Structurally, the rising of the concrete, exoskeleton of the Cathedral has provided a curious contrast to the endo-skeletal steel structure that is the hulking armature for Gehry’s undulating pedals. Perhaps the most salient comparisons however, address the roles these buildings play in the New Downtown. Each monument seems to address different constituencies the influences of which are passing each other – one on the way up, one on the way down – on the index of cultural hegemony: the West-side, “non-ethnic” Los Angeles and the East-side, Latin and ethnic majority. One is civic, non-denominational, yet private. The other ecclesiastic, dogmatic, yet so open to the public as to serve also as a physical shelter in case of earthquake or plague. The idea for this Newsletter’s theme developed after Barbara Lamprecht described an article she was writing that compared the Cathedral and the Disney Hall, in part, as telling contemporary interpretations of an ancient typologies. As the issue took shape, the contributors created a range of variations of this idea – each considering, in addition to the architectural or urbanistic qualities of the buildings, the significance of the Cathedral and the Disney Hall being built at this time in Los Angeles’ history, less than three blocks apart, and by these architects. In Jack Burnett-Stuart’s article, the neighboring but radically divergent qualities of the Gehry and Moneo buildings are compared to another auspicious double-opening nearly a half-century ago in Berlin of Mies’ Nationalgalerie and Scharoun’s Philharmonie. 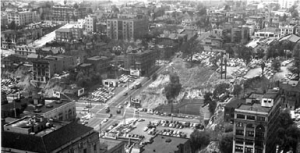 John Dale’s piece revisits some of the historical and urbanistic conditions of Bunker Hill/Grand Avenue that are critical for understanding the true contexts – visible and invisible – of the Gehry and Moneo projects. Vinayak Bharne focuses on the case of the Cathedral, in which the building it is replacing now assumes the dubious status of urban ruin in its abandoned, de-consecrated state. Vinayak Bharne is an architectural and urban designer at Moule & Polyzoides Architects and Urbanists in Pasadena. A graduate of the University of Southern California (USC), he was Assistant Editor of “Saintonge,” the annual journal of the “Center for Studies of Architecture and Urbanism (CSAU) in Saintes, France. Jack Burnett-Stuart has lived and worked in London, Berlin and Los Angeles. He is a board member of the LA Forum and currently co-editor of the newsletter. John Dale is an Associate Partner at Zimmer Gunsul Frasca Partnership in Los Angeles. He co-curated the exhibition “Terms of Engagement: Urban Design in Greater Los Angeles at the Millennium” and, until recently, was Co-Chair of the LA/AIA Urban Design Committee.